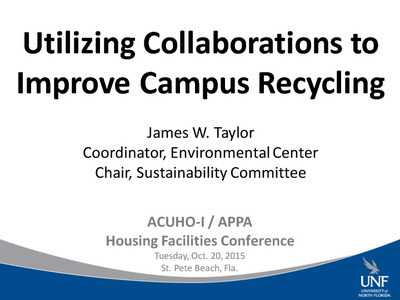 Presentation made to the ACUHO-I / APPA Housing Facilities Conference, Wednesday, Oct. 21, 2015 in St. Petersburg, FL. The UNF Climate Action Plan, which was developed by the UNF Sustainability Committee, outlines how UNF will reduce its greenhouse gas emissions and become carbon neutral by the year 2050. The plan defines UNF institutional capacities and current initiatives for which ongoing support is necessary for success. Additionally, the CAP outlines actions essential for building UNF's capacity to effectively prepare for, implement and track mitigation projects. The plans include improving data collection systems, cultivation of student, faculty and staff support, and securing financial resources. These efforts will be completed in three phases and includes infrastructural improvements, operational changes and a focus on sustainability education and research. This report describes the 2011 Commuting Preferences Survey (CPS) of the University of North Florida (UNF). The goal of the survey is to assess the commuting preferences of the UNF community in order to design efficient and sustainable transportation practices. The UNF CPS was written by UNF Environmental Center staff and created using the online survey tool Vovici. Invitations to participate in the survey were sent to all UNF students, faculty, and staff by Institutional Research; the final response rate was 20.52%. The survey opened on March 7, 2011 and closed on April 11, 2011. Three alternative transportation modes were queried in the survey. 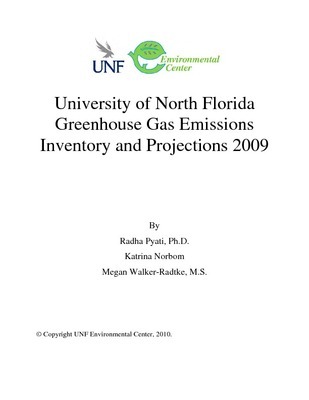 This report describes the 2009 greenhouse gas emissions inventory of the University of North Florida. Such inventories are becoming more important as society approaches restrictions on carbon dioxide emissions due to their effects on global warming. Greenhouse gas emissions inventories have been conducted on hundreds of campuses in the United States, as well as thousands of other organizations worldwide, including U.S. private corporations. An inventory like this generally forms the initial baseline for a campus climate action plan. Climate action plans have also been created by hundreds of universities and other entities. 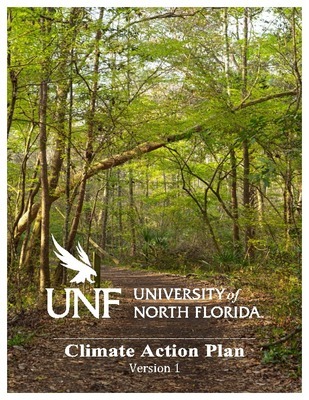 Following the release of this report, a UNF Climate Action Plan will be created by the UNF Sustainability Committee, whose members are listed in Appendix 1, with essential input from the campus community.